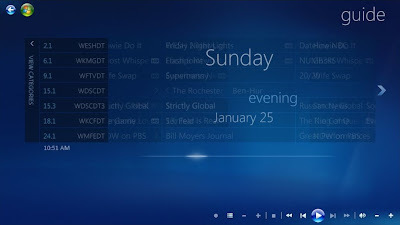 I'll be honest here: the biggest incentive for me to install and play with Windows 7 was Media Center. 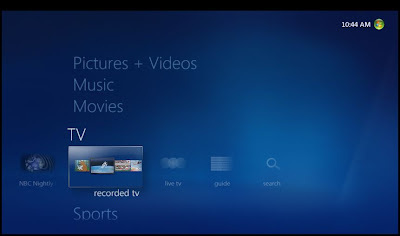 This is Microsoft's software for viewing and recording live TV, as well as playback for movies, pictures, music, etc. It's been around since 2005, but I've never had a chance to use it. 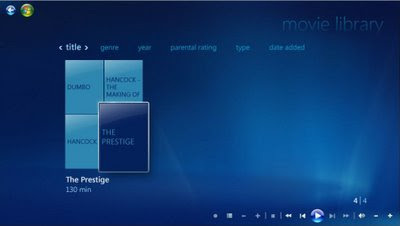 Media Center comes with two versions of Vista, and an improved version comes with Windows 7. We already have a computer in the living room hooked up to our TV. We use it for streaming Netflix movies, as well as watching movies and TV shows from Hulu and the major networks. So the ability to record live TV would simply make the computer all the more useful. 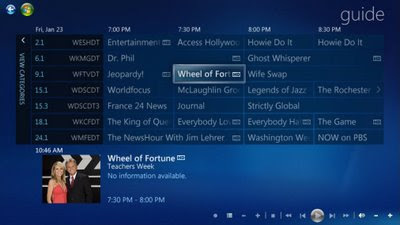 To view live TV on a computer, you need a tuner device. This is simply a piece of hardware that you screw the cable/antenna/satellite line into. These range in price and can often be found for $50 or so. You also need a video card capable of handling live TV streams, especially if you're going to be running HD through it. I have a GeForce 5200 card, which is very cheap and does the job perfectly. And, obviously, if you're going to be recording a lot of TV, you'll need a considerable amount of free hard drive space. I have a 300gb drive dedicated to TV recording. Media Center tells me that it has room for 190 hours of standard def recording or 23 hours of HD. Anyway, on to Media Center itself. The program runs full screen and has a very clean and easy to use 10-foot interface. You navigate through the interface either with a mouse or with a remote. Obviously, one of the coolest features is the ability to view and record live TV. The program even includes a guide for seeing what's on now and several days in advance (the guide is free, by the way, never requiring a subscription). Notice how it even correctly identifies which shows are in HD and which aren't. Very cool. You can click on any program in the guide to get more info about it, as well as access recording options. You can also scroll through the guide very quickly by clicking and holding on the scroll arrow. This brings up turbo scroll, which is very intuitive and makes it super easy to get to a specific day and time. As long as the computer is on, it will always record the shows you specify, even if Media Center itself isn't running. And get this: The system will even come out of sleep mode to record, then go back to sleep after it's done. This is extremely useful, saves energy, and prevents the system from overheating by running 24/7. Once a TV show has recorded, you can get to it from the recorded TV button. This brings up your library of recorded shows. You can see details for each show, such as when it aired, how long it is, and whether it's HD or not. Clicking on a show brings up the details screen. You can either start the show from the beginning, or pick up where you left off. Shows play full screen, but you can always bring up info and access controls. A feature of playback that I am very happy about, is the jump-back fast-forwarding. 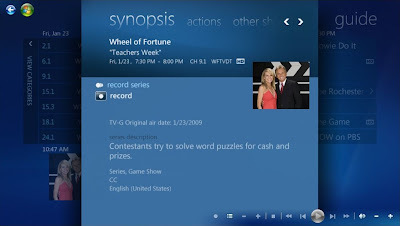 Tivo users know and love this feature, and I'm really happy that Microsoft chose to include it in Media Center. 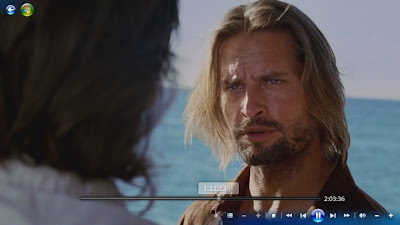 When you're fast-forwarding (through a commercial, for example), when you click play, it jumps back 15 seconds and then resumes playback. How many times have we accidentally fast forwarded into the show itself and had to rewind again? 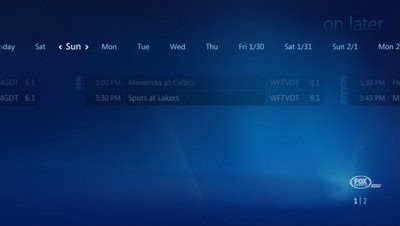 This is so incredibly useful, it's a wonder every single DVR doesn't include it. 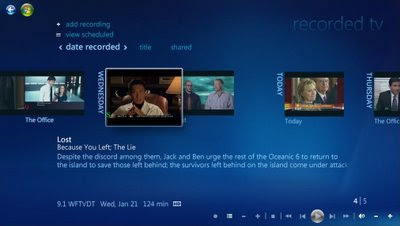 Since live TV is one of the core features of Media Center, you can access the program guide from anywhere within the software by simply clicking the guide button. Another cool feature, is movie watching. 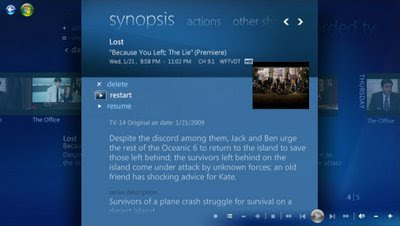 Media Center supports DVD playback, of course, but you can also specify folders on your computer (or network) that contain movie files. I have an external hard drive on my Mac, and I put files of ripped DVDs into a specific folder on that drive. I told Media Center where that folder was, and now when I go into the Movies section, I can see movies on the networked drive and play them back straight from there. I can definitely see myself ripping several dozen of our DVDs for super easy playback through Media Center. An extremely cool feature, I think. For all you sports fans, Media Center has a dedicated sports section. You can view what games are playing currently and what games are playing in the coming days. There's also a specific menu for simply viewing scores. 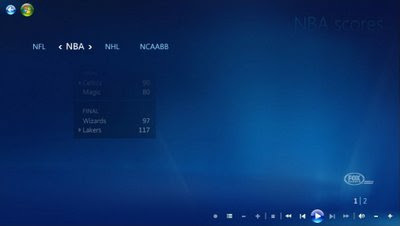 You can view scores by league, which can be very helpful if you simply want to check the score of a game without watching it. So there you have it. A brief guided tour of Media Center in Windows 7. There are several features I didn't even touch on, such as viewing photo librarys, streaming video from various Internet sites, etc. And best of all, Media Center is free to use! You obviously have to purchase a copy of Windows that includes it, but you'll never pay monthly service fees to use it, unlike Tivo. I am really loving the ability to record TV shows now and we'll likely be using this for a long time to come.